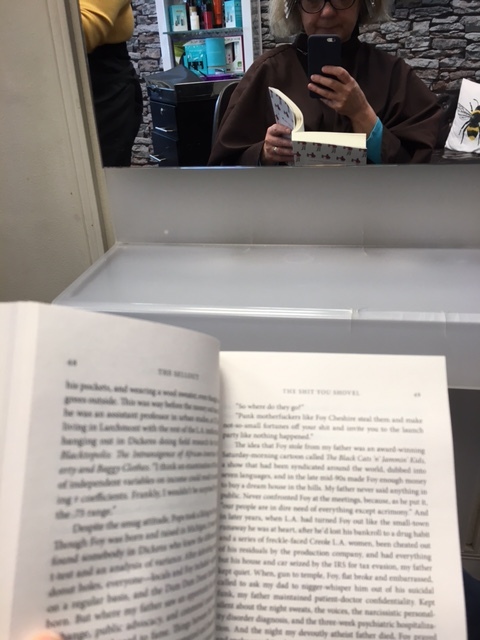 Day Two of National Blog Posting Month and I have a hair appointment. Has to be done, much as I’d love to be the kind of person who can whip out a pair of hairdressing scissors and a box of hair dye and emerge from my bathroom half an hour later looking like a person who hasn’t fallen into a trough of sheep dip and had an argument with a pitchfork. I used to flick through a thick pile of magazines while I was waiting for colour to take (wouldn’t it be great if hair colour was instant?) but these days I take along my own reading materials: poetry pamphlets because they are so conveniently light or a slim volume of poetry or a novel I’m currently reading. I’ve also been known to stuff wads of paper and a pile of pens into my bag so that I get to work on drafting poems while my hairs been wrapped in little pieces of silver foil. I’ve worked out a blogging schedule and drafted the odd post or two, as well, while hairdryers have been breathing out hot air all around me. This is the book I’m currently carrying in my bag. I’ve only recently returned to reading novels after a long spell of sticking with poetry and short stories. This year two books that have stood out for me have been Hot Milk by Deborah Levy and Mothering Sunday by Graham Swift. I enjoyed both, although I wasn’t sure about the ending of Levy’s book. It seemed to trail off. I had something of a lump in my throat reading Swift, partly because the entire novel takes place during one day, March 30th 1924, which is the year my mother was born. She would have been two weeks old. That whole era interests me and the book gives good insights into an age of pronounced class differences and the dying out of a ‘servant’ class. My grandmother on my mother’s side was a scullery maid who worked her way up to cook in a house in Lancashire and the book made me imagine what life might have been like for her. It also offers thoughts about identity: becoming aware of one’s own identity and making conscious efforts to take on or discard an identity that has been thrust upon us within a family. This is a theme that Paul Beatty’s book also seems to be addressing. I’ve only just begun it so I’m still coming to terms with it. It has a long prologue so I wasn’t instantly drawn into its story in the way I was with the previous books I’ve mentioned here. I hadn’t heard of it at all until last week when I watched the Man Booker Prize being awarded on a TV programme. I tuned in because I’d read Levy’s book, which was shortlisted, and I was curious to see if she’d win. I’d also read her book Swimming Home which was shortlisted a few years ago which I’d also enjoyed. 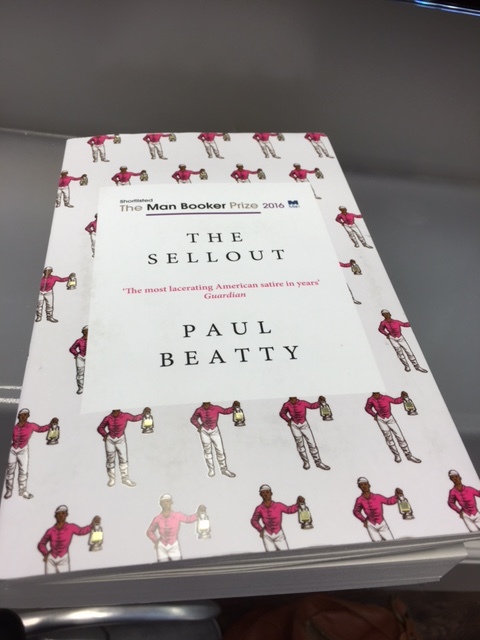 Anyway, Levy didn’t win, Paul Beatty did. He gave probably the least prepared acceptance speech I’d ever heard a person make which made me instantly interested in him and what he had to say. He seemed genuinely not to have expected to win or perhaps he genuinely didn’t care about winning. Something in me was deeply impressed by both the self-effacement and chutzpah in his unreadiness. So I went out to buy the book. Me, the main character in The Sellout, has been raised by his social scientist father on a remote, fictitious rural area on the outskirts of Los Angeles. Me‘s entire life up to age of twenty has been carefully controlled by his father in series of psychological experiments which seek to show how a person, specifically a black American person, develops when he is not at the mercy of unequal and prejudiced laws. Unfortunately, at the age of twenty, Me‘s father is unlawfully shot dead by white police officers and Me is now alone in the world. This is where I’m up to in the book. So far, issues of race are being addressed head on in a way that I haven’t encountered in a novel before and that is almost certainly because I think all of the books I’ve read addressing race have been by white authors, with the exception of Maya Angelou, Toni Morrison and Alice Walker. Facts and statements of inequality are made available to the reader by statistics quoted by Me‘s academic father, although not all of the characters in the book are aware of them. Just as in real life, politicians, the media and advertisers try, and often succeed, in persuading people we live in a ‘post-racial’ world. I certainly know white people who believe this to be true. All of the characters I’ve encountered in the book (up to the point I’ve read ) are black Americans of varying degrees of educational attainment and sociological and cultural make-up. This feels very real and different to books which, in addressing race, tend to categorize people as either victims or oppressors. This book is too clever for that. Ideas about oppression and victimhood circulating in our society are addressed by characters in the book. It feels tremendously unstuffy and is very unlike anything else I’ve recently read, or possibly ever read.